I think that rather than placing prisoners in solitary confinement, we should just force them to watch this episode on a loop for 24 hours. That's more punishment than most people deserve. I barely made it through this hour and only the force of my enormous will stopped me from drinking for the pain. Most people get better as they repeat an action but I think the actors in this series are actually getting worse. I didn't think it was possible but this episode proves it. Watching Clary pretend to flail from a bad dream and Jace continue to glower suggests that more than anything, these actors are in desperate need of an acting class. Then there's Clary stumbling over her words when she sees a shirtless Jace and his smirk when he recognizes how flustered she is. All of it is badly acted and all of it is overly obvious. It's worth noting that shirtless Jace, no matter how nice the abs, is not enough to make me forget how bad of an actor that Dominic Sherwood is. In all fairness however, the actors really aren't helped by the obviously bad writing. Having Isabelle quip that Clary is lucky that she is so flat chested that she doesn't have to wear a bra to call attention that Clary does indeed have breasts and that Jace has noticed them was just too much. I suppose even the writers don't trust the actors to properly portray sexual attraction. This is the most we have seen of Magnus Bane so far. I get that he is supposed to be eccentric but I think that Harry Shum Jr. took it too far, even though I did giggle when he asked if Alec is a flower or cologne man. Readers of the books are all too aware of the relationship which develops between Magnus and Alec. For his part, Alec has been all too obvious of his distrust of Clary which reads as simple jealousy. Having his memory of a loved one taken from Alec was enough for him to break the circle and endanger his team. It was a ridiculous move altogether. It was a memory of Jace, not a fantasy that involved revealing his sexuality. It makes sense given the bond that Alec and Jace have that his memory would be of Jace. I feel like I am being hit over the head with Alec's love for Jace and wonder if the writers have ever heard of subtlety. So Valentine is still on the hunt for the mortal cup. I have to say that for a guy that everyone is supposed to fear, he seems to have the most incompetent people working for him. At every turn each and every one one of Valentine's minions is easily defeated. In the garage, where Clary steps in to save a warlock child, the shadowhunters don't even break a sweat. Why are they scared of Valentine again? So, we all know that Clary is the super special chosen one. Look how willing she is to sacrifice. Look how easily she defeated the memory demon to save Jace. Yeah we get it just move on with the damn story again. Finally, we come to Simon. Simon has managed to survive his capture by the vampires or has he? He goes into a rage when Clary turns to Jace to help her find Magnus Bane and once again begins insisting that they don't need the Shadowhunters. Jace has no patience as Simon storms out. It's an absolute nerd flip out, as Simon compares Jace to someone who used to bully him at school. So yeah, Simon is jealous. Then there's the whole tasting of blood when his bandmate, who at this points is so irrelevant cuts herself. Yeah, Simon's going to be a vampire we get it. When the actors aren't being given ridiculous things to say, totally overacting and posing every two minutes like they are on a photo shoot, the biggest problem is that Shadowhunters: The Mortal Instruments is all tell and no show. It's like being hit over the head with an obvious hammer because it lacks even the smallest bit of finesse. Look, I know that I am not the intended audience for this but even teenagers deserves better than this drek. As aforementioned, for me, this is the worst episode to date. I checked the ratings and unsurprisingly, they are slipping each week. I doubt that this drek will get a second season. I hope this the death knell to the idea that this story can be translated to live action. This series failed as a movie and now it's failing as a television show. 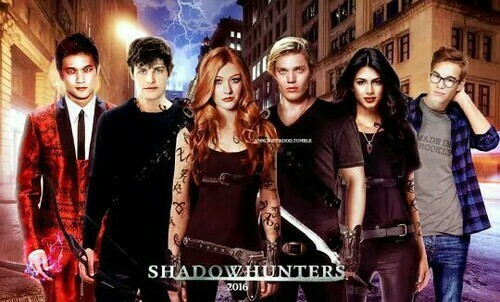 Sure, some of it is the casting and some of it is the writing but at the end of the day, it doesn't really matter the cause because at this point, Shadowhunters: The Mortal Instruments is beyond saving and in fact, it would be a merciful act to simply cancel the show now, rather than subjecting us to the rest of this season. Sense8, Season One, Episode Ten: What is Human?